The Friends reunion is coming, everybody, just in case it hasn’t been your day, your week, your month, or even your year! 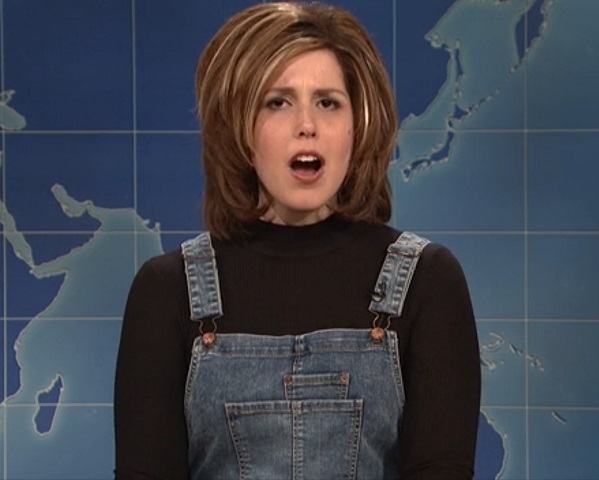 To help us prepare, Saturday Night Live is crushing it as usual, thanks to Vanessa Bayer’s spectacular, spot-on impression of Rachel Green. Bayer, who dropped by Weekend Update this weekend to talk to Colin Jost and Michael Che, might be focusing on specific parts of Jennifer Aniston’s mannerisms, but it’s making us see fashion-forward, Ross-obsessed, eventual mom Rachel in a whole new light. First of all, in the category of “observations we never really put together,” Bayer’s constant repetition of certain words like “Oh Colin! Oh hi! Yeah! Oh wow,” is fantastic and makes you wonder- were Rachel’s lines really written like that, or was it an affectation that Aniston brought to the character? Either way, we’d never really focused in on it before, and now we can’t stop! Second, as Jost asks, “Rachel, okay, is it me, or do you always sound surprised by everything?” It seems like it has something to do with her high-pitched voice, which goes stratospheric on certain words. The sketch also takes time to poke a little fun and classic Friends tropes, like the habit of jumping from scene to scene by inserting outdoor shots of New York. “I’m, sorry, what just happened?” Jost asks in confusion, when Rachel suddenly is finishing a phone call. “Oh, that happens to me every few minutes, yeah, yeah, it’s weird,” Rachel agrees. Let’s hope we see “Rachel” pop up more on SNL in the countdown to the big reunion on February 21st! Check out Bayer’s dead-ringer impression below, and figure out if you’ll ever see Rachel in quite the same light again!